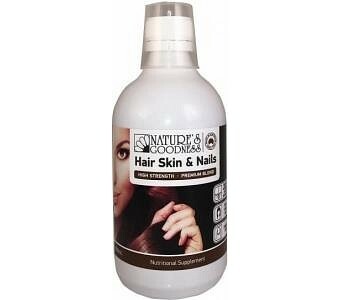 Nature’s Goodness Hair, Skin & Nails Liquid Formula's potent blend of collagen, vitamin C, silica, zinc and biotin will help promote thick, shiny hair, radiant skin and strong nails. Recommended Intake: Take 15mL daily in the morning before a meal. Can be added to juice or water. Ingredients: Water, pear juice concentrate, blackcurrant juice concentrate, silica, lecithin, lysine, hydrolysed collagen, glycerine, vitamin C, zinc gluconate, xanthum gum, flavour, yeast extract, sodium benzoate, potassium sorbate, vitamin B6, vitamin B9.